Fonolo is proud to be a part of The Future Contact Center Summit, January 29-30, 2015 at the Omni Orlando resort at ChampionsGate, Florida! This is the only customer care event that synthesizes emerging trends, customer needs, disruptive technologies and business imperatives, into a clear vision for advancing business strategy. Call centers will learn how future success will be determined by the ability to meet customer expectations better and faster than competitors. The Future Contact Center Summit gives attendees the opportunity to meet with over 500 customer service professionals and visit over 50 exhibiting companies. Conference attendees can chat with Fonolo representatives and learn more about cloud-based call-back solutions by visiting booth #312. We look forward to being a part of this exciting event, examining the future of the contact center, and demonstrating how our innovative call-back solutions can help call centers reduce abandon rates, lower telco cost and improve the customer experience. 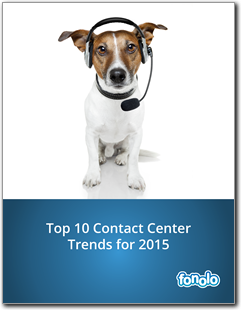 Download our free whitepaper and learn the 10 key trends contact center leaders must understand and address this year.